Are you looking for an alternative to the self-contained sous vide machines? Many sous vide enthusiasts and newcomers to the cooking are looking for alternatives, and for good reason. Some sous vide water oven that are all-in-one are bulky. Not everybody has cabinet space to dedicate to something so large, and it’s far easier to use something that is just as effective or better, and can be broken down into more manageable parts. 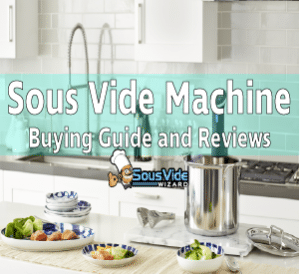 There are plenty of solutions out there for you, and they come in the form of quality circulators that are sold separately from sous vide pots that are also available individually on the market. 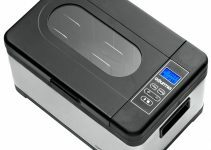 There are plenty out there on the market, but one circulator in particular that rookies and veterans alike should consider is the Gourmia GSV140. This is the second generation of the popular Gourmia Sous Vide Pod, and this version gets just about everything right. First it’s important to understand that this circulator works with an impressive variety of pots. In fact, it will clip on to any pot up to 10 gallons in capacity. That means it can in a likelihood work with the equipment you already have in your kitchen. The choice of pots isn’t the place where Gourmia GSV140 gives you a large amount of choice. Most people take a lot of time to consider how they want to decorate their kitchen, and Gourmia not only understands that, but has built their GSV140 to compliments all the work you’ve done. It’s available in a wide variety of color, and one of them is guaranteed to be the right one for you. The available colors include black, gold, purple, silver, and white. No matter which you choose, your GSV140 is going to have a professional look that you’ll love. A professional look doesn’t count for much, however, unless it can also deliver professional quality. Here, too, the GSV140 delivers. It delivers an impressive 1200Watts, which is enough for anything you might want to cook. It’s powerful, but also designed to run quietly, which is perfect for those recipes that require you run the sous vide cooker for extended periods. The accuracy is almost unparalleled with a margin of error of only +/- 0.01 degrees Fahrenheit. It’s also capable of pumping a mind bending 2.1 Gallons per Minute, so water will be heated to the exact right temperature and circulated effectively. One last touch is the inclusion of a recipe cook book to use with your brand new GSV140. 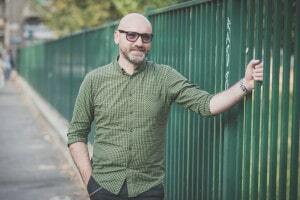 The book is written by Chef Jason Logson, and promises to help you lead a healthier lifestyle that tastes better, too. The Gourmia GSV140 is an easy to use sous vide circulator with heavy-duty capabilities fit for a professional kitchen. It will heat water accurately, and pump that water effectively to cook your food evenly and bring perfect results each and every time you use it. The design itself is sleek and will have you looking like a pro no matter what kind of experience you actually have. Not only is the design sleek and practical, but it’s also available in an impressive array of colors, so it’s guaranteed you’ll find the one that’s right for you. If you’re new to sous vide cooking, then the inclusion of the recipe book is bound to be incredibly useful. It will teach you how to use your new kitchen tool effectively to build a healthier lifestyle, full of food that is delicious and simple to prepare. Be aware, you will need a deep pot to make this work, or otherwise you will have to purchase one yourself. There are plenty on the market, however, and many people will already have a pot that’s well suited for the job. 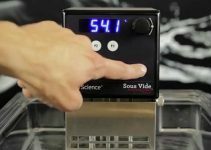 If you’re looking for a space saving alternative to all-inclusive sous vide machines, then you’ve found what you’re looking for. This device will cook your food perfectly each and every time, and best of all it will give you a recipe book of exciting new things to try right out of the box. To pick up your own Gourmia GSV140, you can checkout Amazon where they will provide excellent value and deliver right to your door.